The University of Human Arts and Sciences, established in 2000, consists of Faculty in the Human Arts and Sciences (Department of Human Arts and Sciences, Department of Health and Nutrition), and Faculty in the Health Sciences (Department of Nursing, Department of Rehabilitation, Course of Physical Therapy, Course of Prosthetics and Orthotics). The Graduate School of the University of Human Arts and Sciences consists of the Graduate Division of Human Arts and Sciences (Health Sciences of Mind and Body Master’s and Doctoral Program, Health and Nutritional Sciences Master’s Program). 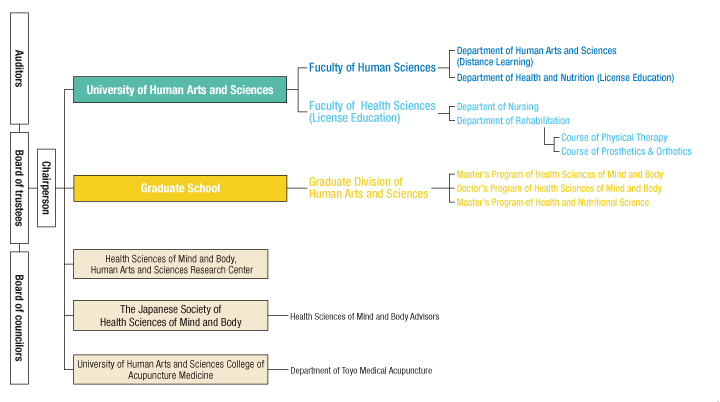 Our university is an integrated institution of higher education specializing in the area of medicine responsible for setting up the Health Sciences of Mind and Body Research Center, and works cooperatively with the Japanese Society of Health Sciences of Mind and Body. The institution started when the University of Human Arts and Sciences, College of Acupuncture Medicine was first established in 1953. With the advancement of medicine in Japan, we have attained a certain position based on Eastern medicine. 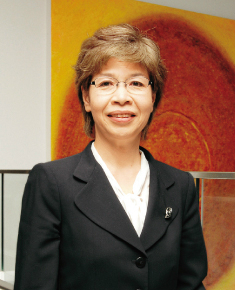 After becoming an educational foundation, the institution has fostered human resources who contribute to improving the quality of life (QOL) of people, and as a result has received praise from the surrounding society. As medical technology has advanced, the college has contributed to areas of medicine, health, and human welfare by offering educational programs such as nursing, physical therapy, prosthetics orthotics, and others. The University of Human Arts and Sciences has attempted to systematize the academic disciplines making up “Health Sciences of Mind and Body,” which includes various aspects of the human being. In our faculty education, we offer programs of understanding human beings scientifically and comprehensively through the approaches of three academic regions. These are the“ science of mind,”“ science of body,” and“ science of culture and society.” The science of mind studies the inside of the human being. The science of body grasps the human being from the physical aspects. The science of culture and society considers the relationship between the social environment of history and culture and the natural environment of material and life. We aim to construct an integrated theory for“ Health Sciences of Mind and Body” at the Graduate School of the University of Human Arts and Sciences. The research theme of the new academic discipline is the correlation of mind and body, a key concept for the health and happiness of human beings. This theme scientifically and comprehensively grasps various phenomena about human beings. We are the only educational institution in Japan that offers the degree of “Health Sciences of Mind and Body.” We have gained domestic as well as international public attention as a result of this degree. In response to the demand that we have created, our university has published textbooks such as, “The Series of Health Sciences of Mind and Body (eight volumes),” including “Health Sciences of Mind and Body” and its English edition. In addition to publishing texts, we have offered educational activities in Japan and around the world. The theme in the series is to create “knowledge for well-being.” The foundation of our education is to know one’s place in society and to determine the best direction for living a better life. While studying this series, one can create and select “Knowledge for Well-being” as an option for conducting one’s life. “Knowledge for Well-being” becomes a source of power for confronting a largely problematic society. In this way, we believe our education system can contribute to society by fostering human resources supporting people’s health and happiness, as described in our vision. Your actions depend on your will. Your happiness depends on your heart. Whether you live passively or proactively … your heart makes the decision. rescue, and healing are all determined by the way you respond to adversity. and has been travelling down an incredibly long way to be passed down to today. Contemplate" civilization" which has maintained society as a collective entity of the wisdom and enterprise of humankind. Then observe, refl ect and deepen your understanding of the" heart,"
the origin of behaviors and thought processes held in common by all human beings. The knowledge will become your" Knowledge for Well-Being"and the heart to enhance the quality of your life. Accept the changes in life that come with time that passes with every moment. Enjoy the fact that you are living. Cultivate a contented heart and value your life. Human beings are human because we have the power to find ways to live together with respect for ourselves and others. I believe that pursuing knowledge is to change for the better. In other words, promote constant modifi cation of actions. I sincerely hope that we will continue to live together and to encourage each other as partners in pioneering the future.